Kurt Hanson, publisher of the Radio and Internet Newsletter, wrote a great piece that was published in the Los Angeles Times last week. It was about webcasting and six ways the music industry can solve this whole online royalty rate hike mess that threatens to go into effect July 15. Rethink your approach to peer-to-peer file sharing: Record labels in the 1930s tried to prevent radio stations from playing their LPs because they thought it would hurt sales -- after all, why would someone buy the disc if the radio was playing it for free? As it turned out, airplay actually helped sales! The Bing Crosby records that got airplay sold a lot more copies than those that didn't. The same may be true of P2P. Remember, the music industry's best year ever coincided with P2P's strongest year ever (i.e., the year Napster was at its peak). People sampled vast quantities of music via P2P and they bought the stuff they liked on CD. It's counterintuitive but it might be true. Quit being a jerk to your customers: Every month, the record industry causes an untold amount of pain for thousands of consumers by suing them for exposing song files via P2P services. You're causing tears, heartbreak and stress; you're taking away vacation savings and college funds. And you do it in such a way -- a slow steady stream of lawsuits every month -- that you derive virtually no worthwhile public relations value from it. You guys simply severely damage thousands of people's lives every month because you can. Embrace your friends: Virtually all Internet radio properties today were launched by music fans -- people who love their genre (or genres) of music and want to see the musicians and labels involved succeed. They've designed Internet radio products that are, in fact, getting people excited about music again. Regarding this whole royalty imbroglio, to quote Jack Bauer, "You're making the wrong play." Instead of asking for a royalty rate so high that it would bankrupt webcasters and shut them down, as you did in your successful case to the Copyright Royalty Board, you'd be better off offering webcasters a livable royalty rate and a plan to work together to sell more product to consumers. If you guys do, you'll be surprised how effective working together can be! Did you enjoy this blog post? Subscribe now and get all of my newest ideas delivered by email or RSS feed. Learn how here. 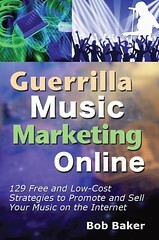 Check out the revised and updated edition of Guerrilla Music Marketing Handbook, with four new chapters on Internet music promotion. Get more details here. for freakin real. I'm so outraged by the government's attempt to dip their hand in yet another cookie jar they haven't already gotten their hands on. Is Payola Settlement Good for Indies?